It is no fluke that solitary confinement is one of the worst punishments we have devised. Our brains are so exquisitely calibrated to read those around us that we can hardly survive alone. Two recent books, one by a neuroscientist and the other by a psychologist, make the case that we are all wired for social living. Both argue that we can ignore this fact at our own risk. Marco Iacoboni, a neurologist and neuroscientist at the University of California, Los Angeles, is one of a growing number of researchers who believe that we owe much of our ability to interpret the minds of others to a class of cells called mirror neurons. Mirror neurons were discovered in Parma, Italy, in the early 1990s, when a lab assistant noticed that a single cell in a macaque's brain fired both when it reached for an object and when it saw others grasp that object. The monkey's brain seemed to be simulating every action it saw, pointing to a shockingly simple mechanism for the complex behavior of imitation. Ethics will not permit scientists to tap into single neurons in people, but neuroscientists are making the best inferences they can from brain scans such as functional MRIs. Iacoboni's attempts to measure neural responses to Super Bowl ads and presidential candidates have rightly been labeled “neuropunditry” by skeptical observers, and his argument that mirror neurons explain language seems forced. But he does make a powerful and charming case that mimicry is an essential part of human empathy. 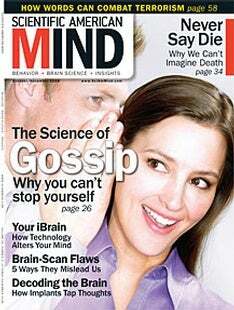 It is not always clear how mirror neurons are involved, but the behavioral studies are suggestive. When people are asked to grip a pencil between their teeth, they are slower to detect emotion in other people's faces, because they cannot mimic those expressions. If mirror neurons allow us to feel what others are feeling, as Iacoboni claims, we should expect to see a breakdown in empathy when they are on the fritz. And indeed, Iacoboni cites a recent finding (by his wife, Mirella Dapretto, also at U.C.L.A.) that mirror neurons are defective in autistic children. Broken mirror neurons do not necessarily cause autism, however; as Iacoboni observes, the cells may be weakened as a result of autism. But Iacoboni may have stumbled on a promising treatment. When therapists imitate the rigid and repetitive gestures of autistic children, then invite the kids to imitate healthy actions, the youngsters seem to get better. University of Chicago social psychologist John T. Cacioppo (with Journal of Life Sciences editor William Patrick) tackles a more widespread form of social alienation: loneliness. Cacioppo has discovered that lonely people tend to be more sensitive to cues sent by others but have a harder time reading them accurately. Even as they crave human contact, they are demanding and withdrawn, leading to a spiral of isolation that can cause high blood pressure, poor sleep and premature aging. Chronic loneliness is a hunger that refuses to be fed. Although he dutifully rehashes the literature on sociability, Cacioppo is at his best when he gets out of the lab—in one case, to a Chicago lakefront to show passersby photographs from space, where he fi nds that the lonely are more likely to attribute human intentions to clouds of interstellar gas. Another experiment suggests that lonely people will accept unfair treatment that others will not. After learning that 60 million Americans are suffering from this hidden epidemic and hearing Cacioppo argue that it should not be lumped in with depression, one might expect him to propose that psychiatrists make room for loneliness in their catalogue of mental disorders. But, strangely, Cacioppo backtracks when he admits that persistent loneliness is not its own disorder but a normal risk of being human. They may both be right. Our species has a natural gift for mimicry that allows us to enter into one another’s minds effortlessly. We also have a craving for contact that makes us vulnerable not only to one another but to our own solitude. The instinct to connect comes with an addiction to company. For better or worse, we are born with both.